In this, the season of demonstrations and marches, there is a call for ‘better government’, but is that possible when the problem is the system of government itself? Along with that is a call to block the austerity budget put forward by the government (see photo). The Constitutional Crisis of 1975 gives some insight into questions that arise from this movement. In October 1975, the Liberal/Country Party Opposition used its control of the Senate to defer passage of appropriation bills, or supply, which finance governmental operations and which had been passed by the House of Representatives. This led to a constitutional crisis and the dismissal. This article looks at the role played by the Chief Justice, Sir Garfield Barwick, and his associates from the legal profession in the bloodless coup that followed. The premises of a large portion of Sydney’s legal profession are in Phillip Street. It is also the home of the New South Wales Rugby League. All the main protagonists of the 1975 dismissal began their professional careers in Phillip Street – all save for the victor, Malcolm Fraser (Prime Minister 1975-1983). Fraser was a grazier from Nareen in Victoria. Whitlam (PM 1972-1975) appointed Lionel Murphy (Labor Attorney General) to the High Court in 1975. Barwick (Chief Justice) was appalled for Murphy boasted that he would become Chief Justice when ‘the time was right’. Another lawyer from Phillip Street, ‘Diamond’ Jim McClelland was Minister for Labour and Immigration and Minister assisting the Prime Minister in matters relating to the Public Service from 6 June to 11 November 1975. Diamond Jim was also an old friend of Kerr’s. Jim McClelland advised Whitlam during the crisis but was deceived by Kerr throughout. Bob Ellicott (Lib Attorney General 1975-1977) was double cousin of Sir Garfield Barwick. Ellicott and Barwick relied on the Phillip Street connection to signal to Sir John Kerr that if he were to seek the advice of the Chief Justice, Barwick would give approval for the sacking of the popularly elected Whitlam Labor government. Kerr sought Barwick’s advice on the 9th November 1975 and sacked Whitlam two days later on Remembrance Day. Kerr was following the legal maxim for examination of a witness in court, never ask a question when you don’t know the answer. So on 16th October 1975 Barwick and Ellicott allowed the rumour mill at Phillip Street to convey to Kerr that if the Labor government was unable to guarantee supply (that is the finances to carry out its programs) it was his ‘duty’ as Governor General to sack Whitlam and install Fraser. Whitlam was no stranger to such controversy. In the year previous (1974) the Liberal-Country Party opposition led by William McMahon denied his government supply. Whitlam called their bluff by going to a ‘double dissolution’ election which Labor won and immediately put all its modest reform agenda before a joint sitting of both houses. This included the establishment of a national health scheme (Medibank), plans to set up a national petro-chemical industry, a bill to enable voters in the ACT and Northern Territory to elect their own senators and to reform the gerrymander that favoured country voters. Barwick opposed the joint vote on these bills claiming that a government can only put the bills refused prior to the double dissolution, not the entire agenda. Whitlam ignored Barwick’s opinion and got Medibank, which was opposed by the Liberals and Country Party, through the parliament. All the players except Fraser knew each others ambitions, opinions, personal lives, weaknesses, and strengths. Note the complete absence of women. The protagonists professional lives were born from the same cauldron, Phillip Street legal fraternity. So when the conspiracy was set in motion, it may have been stopped at any point along the way unless secrecy was maintained by the key protagonists: Fraser, Kerr, Barwick and Ellicott. Whitlam could have sacked Kerr so the Governor General pretended to support the man (Whitlam) who had appointed him (Kerr) until the night before the dismissal. The two cousins (Barwick & Ellicott) had signalled to Barwick through gossip at Phillip Street that they would support a constitutional coup. The entire legal profession was involved because Whitlam sought alternative means of finance through the banks. So the banks sought advice from prominent members of the bar including silks from Phillip Street. The Liberal Party sought advice from Murray Gleeson on the crisis. Gleeson was later made Chief Justice of NSW directly from his Phillip Street chambers and later still (in 1998) was made Chief Justice of the High Court by John Howard. No glaring illegality could be found in the banks lending money to the government. Yet no monies were sought and none lent. Whitlam told Kerr not to seek advice from Barwick (Whitlam knew the gossip). So on the 9th November, Kerr sought a private consultation with Barwick to obtain approval for the sacking. Kerr knew what Barwick would say and on the following day Barwick wrote his advice that it was the Governor General’s duty to sack Whitlam and appoint Fraser as caretaker. This was not the first time Barwick had given judgement without recourse to precedence, rules, law or convention. Barwick simply used his position as Chief Justice to give Kerr the go ahead. Kerr followed his advice and sacked Whitlam the following day and installed Fraser as Prime Minister. At that moment Whitlam still had sufficient funds to run the government programs for a month and his government was climbing in the polls. Within 72 hours of his appointment as Prime Minister, Fraser secured supply with the support of the Labor party. This followed the rule, Tories deny supply, Labor Parties don’t. Thus ended the last reformist ALP government in Australian history. Each subsequent Labor government was worse than the one preceding it allowing de-regulation of the financial system (Hawke/Keating), privatisation of the Commonwealth Bank (Hawke/Keating), sale of QANTAS (Hawke/Keating), privatisation of Telstra (Keating), refusal to place a lid on climate change (Rudd), support for the war in Afghanistan (Rudd/Gillard), support for the US alliance and Israel (Rudd/Gillard). In this way successive Labor governments gradually became indistinguishable from their opponents in both Federal and State parliaments. Barwick as Chief Justice of the high court consistently read down the Income Tax Assessment Act (1936) [ITAA]. In particular he savaged the anti-avoidance provisions in section 260 of the ITAA. Section 260 dealt with the tax avoidance schemes that were rife in the 1970s and culminated in the bottom-of-the-habour schemes of the 1980s. It became optional for the wealthy to pay tax in Australia while Barwick led the High Court. Billions in revenue were lost while wage earners bore the burden of funding government programs through PAYE tax. Barwick used narrow ‘black letter’ law to strike down attempts by the Tax Office to get companies and high wealth individuals to pay tax. Is the tax system any more equitable now? I think not. It may seem unlikely that there would be another dismissal like what happened in 1975, but what would the judiciary and executive do should there be a double dissolution election as occurred after the dismissal in 1975? Supposing current unpopularity of the 2014 austerity budget forced opposition parties and independents to deny appropriation bills necessary for the functioning of government. Remember that the federal government requires the support of Palmer United Party in the Senate to pass its budget bills. Would the judiciary and the executive again seek to deny the people their say in the outcome as Fraser, Kerr and Barwick did in the bloodless coup of 1975? How would the workers movement and unions respond to such provocation? In the December 1975 election, the Fraser Liberal / Country Party won a majority of seats in both houses despite large rallies and strikes by workers at the dismissal. For example, over 15,000 people assembled in King George Square on 14th December 1975 three days after the dismissal. 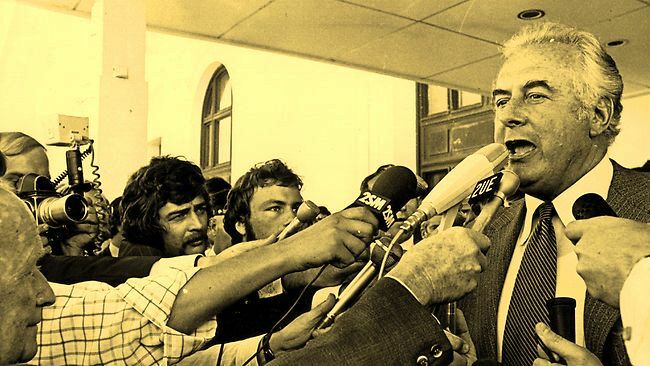 Speaking at the rally, Whitlam urged people ‘to maintain the rage’, meanwhile Hawke (then President of the ACTU) urged calm and used his influence as head of the union movement to undermine further attempts at strikes. 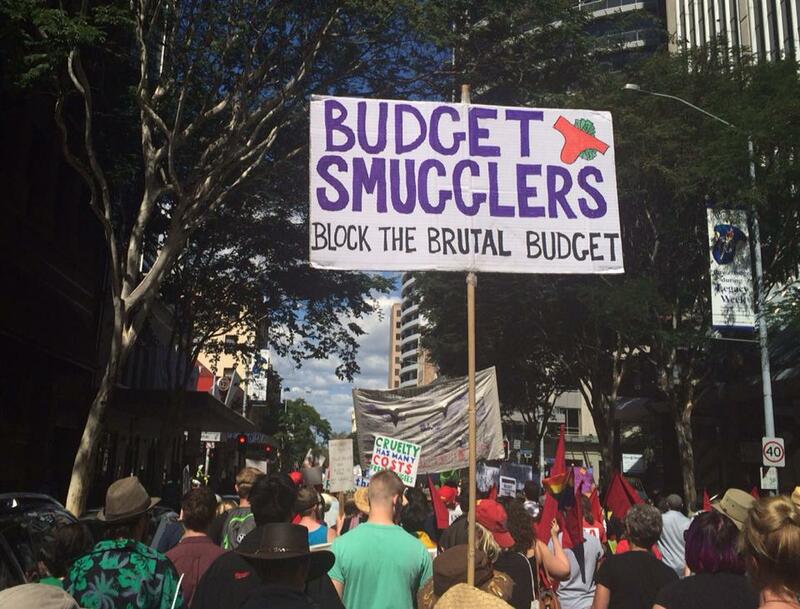 Only 1,500 (one tenth) of the people at the rally marched on the Queensland Parliament. This was despite the fact that Bjelke-Petersen helped bring down the Whitlam government by placing his man, Albert Patrick Field, in the senate after the death of the ALP’s Bert Millner. Field’s vote helped block supply. People who were to become key figures in subsequent governments (e.g. treasurer in the Gillard government, Wayne Swan) accompanied the march but only on the footpath, signalling like Hawke, that he would not support radical change. In this, the season of demonstrations and marches, there is a call for ‘better government’, but is that possible when the problem is the system of government itself? A system that permitted a small coterie of lawyers and bankers to bring down a democratically elected government? This entry was posted in democratic rights, Unions. Bookmark the permalink.